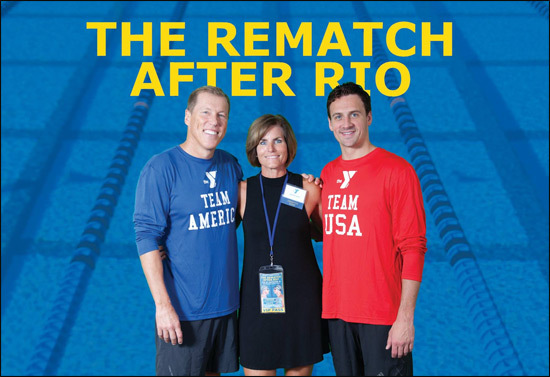 The Ormond Beach Family YMCA together with Stewart-Marchman-Act Behavioral Center raised over $50,000.00 thanks to the charity of Ryan Lochte, Charlie Lydecker and so many others at the Rematch After Rio held on September 28, 2016. Over three hundred people attended this fun event in which two swim relay teams, one anchored by Ryan Lochte and the other by Charlie Lydecker, went head to head for a good cause. Of course, Ryan’s team won! Paul Rice swam a 50 yard free style leg and carried (embellishing, of course) the Ryan Lochte team to victory. Paul’s wife, Kristi, is pictured here with Ryan and Charlie before the event. The Ormond Beach Family YMCA is in the midst of a six million dollar capital fundraising campaign to completely renovate its aging facility. Phase I of the project to renovate the swimming pool and deck at a cost of over 1.5 million is complete. Phase II, which will be a people/dog park, half mile walking trail and additional parking is about to get under way. Renovation of the complete facility is phase III, and the Y is about 85% of the way toward meeting its fundraising goal to complete the project. Paul Rice serves on the board of directors for the Ormond Beach Family YMCA.